To celebrate Independence Day in the US, there’s a new Fireworks app for the Samsung Gear VR (reviewed here) where you can watch fireworks over the Statue of Liberty with music in the background. The app is by Presence Studios, developers of GrooVR, one of my favorite apps for showcasing the immersiveness of the Gear VR. 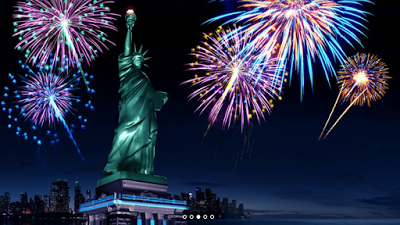 The Fireworks app is a simple simulated view of the Statue of Liberty from the New York Harbor. As music plays, fireworks are launched in sync with the music. Unlike the moving perspective in some experiences in GrooVR, the view in Fireworks is from within a fairy small virtual area, so it will be pretty comfortable to view for almost anyone. The Fireworks app is a free download from the Oculus store.